A few more feet was all Clint Conatser needed. His hard shot to center with the bases loaded and the Braves trailing 4-1 in the eighth inning of Game Six of the 1948 World Series was caught by Cleveland’s Thurman Tucker against the outfield fence; had the ball hit or cleared the wall just above Tucker’s glove, there is a good chance the Braves might have rallied to capture the game and set up a winner-take-all finale at the ballpark the next afternoon. Ace Johnny Sain, who had allowed just nine hits and two runs over 17 stellar series innings, was already set to start the seventh game for Boston. Conatser, however, didn’t get those extra feet. His pinch-hit smash off Indians hurler Gene Bearden wound up as a helpful but inglorious sacrifice fly that scored Tommy Holmes from third and cut the score to 4-2. Phil Masi followed with a pinch-double to bring Boston one run closer, but Bearden stopped the rally there. After he shut down the Braves in the ninth as well, the victory and the championship went to Cleveland. Bearden (who also pitched a shutout in Game Three) was the hero, and Conatser merely a footnote in the box score – long forgotten to history. It was a terrific environment for a young athlete to grow up in. Although his father had been a semipro ballplayer for the L.A. Creamers, it was with and against his peers that right-handed Conatser honed his skills. “We all played over at the Manchester Playground – all year round, nothing but baseball. We had no coaches or organized teams until we got to Legion ball, but we had a playground director named Bill DeVernet who would make out lists of ‘teams’ like the Cardinals, Braves, and Yankees. Then we’d just go out and play. We watched the older pro players when they came back home and practiced. Kids are pretty good mimics.” Among the guys they imitated were Cardinals catcher Mickey Owen, later Reds third baseman Steve Mesner, and Red Sox star Doerr. It was a formidable roster indeed; Lemon (a future Hall of Famer) would star in the majors, as would Hegan and Reynolds. Conway and Embree were also future big-leaguers, and with such talent to choose from, 17-year-old Conatser, a 5-foot-11 outfielder and second baseman, was sent down to Class D Fargo-Moorhead in the Northern League when the season started. Before the year was out he would play for Class D Logan (in the Mountain State League) and Johnstown (in the Pennsylvania State Association) as well, and all told he hit .261 with nine homers and 57 RBIs in 107 games. The next spring he was rewarded for this solid debut with a $10 raise to $85 per month and a spot with Class C Flint in the Michigan State League. By this point he had been converted to a full-time outfielder. After hitting .327 for Flint with excellent power (10 homers and 44 RBIs in 54 games), Conatser was sent back to Fargo-Moorhead midway through 1940 and fell off to .236 the remainder of the year. This kept him at the Class C level in ’41, predominantly at Charleston of the Middle Atlantic League, where in addition to the outfield he also saw time at shortstop and third base but hit .248 with just three homers. Although he remembers some scouts from other big-league clubs showing interest, Clint decided to put himself on the voluntary retired list and enlist in the Coast Guard after Pearl Harbor. He would eventually serve his country from 1942-45, including a stint in the South Pacific. Clint had a strong year in 1947 split almost equally between the two coasts, batting .287 with 14 homers in 120 games (.279 with Buffalo, .298 with Seattle). He figured he had earned another invite to Tigers training camp, but now out of options, he was left on the Buffalo roster – and was promptly plucked up by the Boston Braves organization in November of ‘47. This time he was determined to stick on a big-league club come spring, and prepared accordingly. In addition to his strong showing in exhibition play – which included a home run to help defeat the Red Sox – Conatser was involved in an incident of a near-calamitous nature as the Braves were barnstorming north through Virginia. During warm-ups before an April 12 game with the Richmond Colts, he hit a “savage line drive” that struck teammate Warren Spahn in his left (pitching) shoulder. Spahn quickly recovered, however, and Conatser made the club. The Braves traded off Litwhiler to the Reds on May 11, but this didn’t make Conatser a regular starter. Although Tommy Holmes was a fixture in right, Southworth kept his other four outfielders shuttling in and out of the lineup based on the opposing pitcher. Only Holmes played more than 110 games, with Conatser, Jeff Heath, Mike McCormick, and Jim Russell all getting into 75 or more. Right-handed Clint hit primarily against lefties; so insistent was Southworth in his righty-lefty swaps that he had Conatser regularly switching with his left-handed roommate, Heath, even though one could make a good case that Heath – who hit .319 with 20 home runs and 76 RBIs in just 364 at-bats – deserved to be in the lineup every day as the team’s best power threat. Conatser hit .277 with just three homers and 23 RBIs himself in his first big-league season, but he made several key contributions to the Braves’ pennant-winning campaign. He went into the starting lineup for a stretch when Jim Russell got hurt, and hit all three of his home runs in a one-month span as Boston battled for the top spot in the National League. His first homer, one of three hits Clint had vs. the Pirates on July 27, helped pace the club to a 5-1 win before 29,031 at Braves Field. 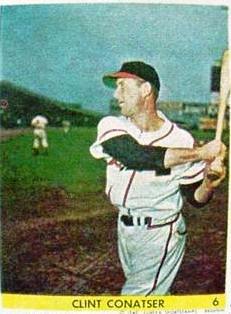 On Aug. 17 he had a single, triple, and homer as Boston beat the Giants at the Polo Grounds, and five days later he delivered his biggest long ball of all – a two-run, eighth inning blast off Erv Palica into the left-field stands at Ebbets Field that provided the winning runs in a 4-3 win that moved the Braves two games in front of the second-place Brooklyn Dodgers. Clint haunted the Dodgers with more than homers in August. The day before his clutch shot off Palica, he had collected a key fifth-inning RBI double as the Braves won 2-1 to gain a split of a doubleheader at Ebbets Field and stay one game ahead of the Bums. And in a 4-3 win at Braves Field a week before that, he had kept a three-run, ninth inning rally against Brooklyn alive with a bunt hit down the third-base line, then finished it by scoring the winning run on a sacrifice fly. Once the Cardinals moved into second place, Conatser helped beat them as well – going 4-for-9 with a pair of doubles in back-to-back road wins on August 24 and 25. And although many Braves players reportedly grumbled about Southworth’s platooning, Conatser – who benefited from the system as much as anyone – had nothing but praise for his manager. “I’ll tell you, Southworth had a lot of respect from the ballplayers. I think there was some talk that he grabbed all the headlines, but I think the papers did that. The sportswriters worshipped him, and called him the ‘Little General.’ He was outstanding as a manager, and he did outstanding things. Conatser had strong memories of his teammates as well, but was not shy to tell it as he saw it. “They talk about Spahn and Sain and two days of rain. I always get a kick out of that, because Spahnie won 15 games that year – one of the few times he didn’t win 20. It was one of his worst years, but he did lose some tough games. It seemed like every game I played in was a one-run game, or something like 3-1, and Spahnie was in a lot of those games coming up on the short end. There was some consolation to go with the postseason setback – a record loser’s share of about $4,600 thanks to the crowds of 80,000-plus in Cleveland. “I took my money and paid cash for a house in Gardenia [California], which cost me $6,500,” said Conatser. “My mother raised me that you didn’t charge anything and you don’t owe anybody, so I bought a little house. Trouble was, we didn’t get the money until December, so I came back and went right to work at Santa Anita racetrack as an usher and ticket-taker with Bob Dillinger [of the St. Louis Browns].” An amusing Associated Press photo ran nationwide on February 13, 1949 that showed the pair in their “other” caps and uniforms and played up the fact Dillinger had sent back his latest Browns contract unsigned. The caption read: Bob Dillinger, bespectacled third baseman of the St. Louis Browns, is shown discussing his baseball salary problems with Clint Conatser, Boston Braves outfielder, at Santa Anita Park, where both are clubhouse attendants. Conatser recovered quickly to make the club, and was a starter in left field for many of the season’s early games. The Braves started slow, but took over first in May and were still in the top spot when they headed to Philadelphia at month’s end. Boston won two of three, and Clint was on fire – going 8-for-10 including three doubles, two home runs, and eight RBIs. Despite this output, part of a 14-day stretch on the road in which Clint hit .486 (18-for-37), Southworth amazingly had him platooning again with Russell when the team returned home June 1. Clint fell cold at the plate, and his average, once comfortably above .300, dropped well below this mark during the next month. Ironically, it was the return of his old roommate that signaled the end of Clint Conatser’s big league career. On July 8 newspapers reported that Heath would be ready to resume playing within two weeks after a 10-month recovery from his broken ankle; his return to the roster would give the Braves one too many outfielders, and shortly after the All-Star break, on July 15, Clint was sent to minor league Milwaukee. He was hitting .263 with three home runs at the time, and his last hit in the majors had not even counted – a homer slugged over the left-field wall at Fenway Park in a mid-season exhibition game with the Red Sox on July 11 to benefit charity. His departure from the Braves was unceremonious. “I was the only player who had any options left, so they optioned me out,” Conatser recalled. “I was 28 years old at the time, and I just said to myself, ‘Hey, you gave it your best shot. Just get out of it.’ So I quit [after the season].” The player recalled by Boston to replace him on the roster was none other than Heath, who after an unsuccessful comeback would be gone from the majors himself by year’s end. Back in the Pacific Coast League after a three-year hiatus, Conatser could not duplicate his 1947 PCL success at Seattle. He hit .231 with Hollywood in both 1950 and ’51, appearing in fewer than 100 games both seasons and peaking at nine home runs for manager Fred Haney (who would later distinguish himself as pilot of the 1957 World Champion Braves). It was during this period that Stars management tried to boost sagging attendance by having its players wear shorts, a novelty that made for intriguing photo ops but also plenty of cut-up legs. In 1952, then with the Portland Beavers, Clint was doing much better (a .268 average playing every day) when he surprised the team by quitting abruptly on July 6. He was still just 30 years old. The only time Conatser’s name popped up in the sports pages after this was when he would join other former ballplayers living on the West Coast at fishing derbies and golf tournaments (he was among the best of the old-timers at both pursuits). His air conditioning business prospered, and he later spent more than 30 years buying and breeding race horses – often partnering with another old Brave, Joe Adcock, who raised Clint’s mares on his Louisiana farm. As the decades passed, Conatser’s alma mater, Fremont High, continued turning out big leaguers like Bob Watson, George Hendrick, and Chet Lemon. By the 1990s photos of horses shared space with old baseball pictures on the walls of Clint’s comfortable condo, located just off Route 5, 30 minutes from Anaheim Stadium. He stayed ruggedly handsome into his 80s, and came back to Boston a few times for Braves reunions. By the summer of 2007 he was one of the last living players from the 1948 NL champions, and when his daughters gave him a copy of the ‘48 World Series on videocassette, he enjoyed playing back his Game Six at-bat in slow motion and adding his own commentary with a sly grin. Author interviews with Clint Conatser, 1991 and 2004. Mort Bloomberg interview with Clint Conatser, 2007. “Manchester ‘Alma Mater’ of Many Stars,” by John De La Vega, Los Angeles Times, Feb. 19, 1948. “Rookie Clint Conatser May Make Grade in NL,” by Ed Rumill, Christian Science Monitor, March 30, 1948. Other assorted Boston Globe, Chicago Tribune, Christian Science Monitor, Hartford Courant, Los Angeles Times, New York Times, Associated Press, and United Press International articles, 1946-1984. “Looking Back at a Few Diamond Memories,” by Mort Bloomberg, Boston Braves Historical Association Newsletter, summer 2007.